The modular drop-in non-refrigerated cold pans are designed for top-mount installation. 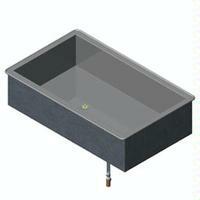 A full-perimeter drip edge contains spills and condensation within the stainless steel countertop area of the drop-in. High-density polyurethane foam insulation surrounds the exterior of the well to provide better temperature maintenance and hold ice longer. The 8" deep display well provides maximum capacity for ice, essential for optimum presentation and performance. The seamless well is designed for maximum capacity. 1" integrated drain is standard.